A short tutorial on how to create a user profile in a WordPress blog so as to restrict/grant access to different areas of the dashboard. Every user can control his content through the dashboard itself and also deal with content created by others. It simplifies the whole publishing process from uploading images to editing. There’s no need for a single individual to upload and manage the content separately. Instead, all users are free to do that by themselves depending on their role. Having profiles for all the members makes it easier for them to perform their roles, whether it’s related to coding, analyzing stats or writing related. Everyone can work together at once. Assigning various profiles to your blog users can definitely reap positive results and simplify the workflow, especially with a larger team. Hover over the Users option and > click on Add New. This will open the Add New User section. 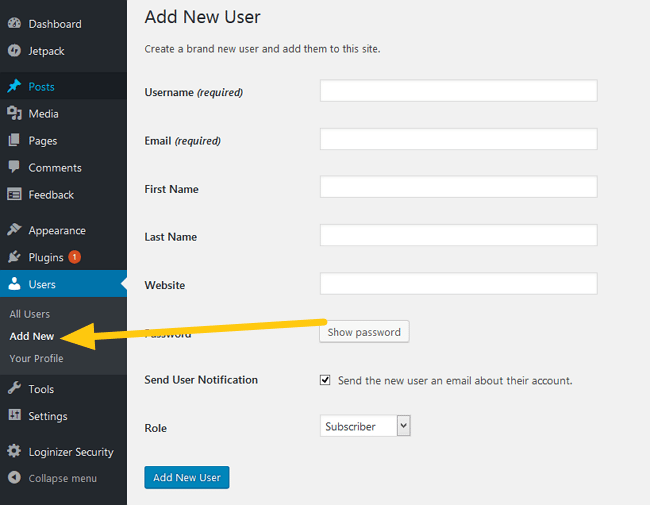 From here, you can add the new user’s details such as username, password, name and role. Fill up the details and click on Add New User. The new user will be sent his profile information after which they can execut tasks right inside your blog. It is also in this area that you can change their password, add a profile photo, and more. Currently WordPress allows you to choose from five roles for a user. They are explained along with their significance as follows. An administrator is most authoritative. They can do everything possible on a website, ranging from adding and publishing new content, adding new plugins, tweaking the code, to deleting new users. The editor has whole control over content. They can add new media files, delete posts, and edit the drafts created by them and others. The role is limited to content and they cannot modify other parts of site. An author, too, can write, edit and publish their own posts whenever they wants. However, they don’t hold any control over posts created by others. A contributor can write, edit and add new posts, but cannot publish them unless they’re moderated by the editor or admin. A subscriber is the least powerful role and doesn’t have any website or content related responsibilities. They can comment or interact with the website. It’s more widely used in subscription and sign-up based sites. Remember, you can change a user’s role at any time so don’t be worried about being locked in to a particular set of roles.